This ammonite was found in Deux-Sèvres in France and comes from the Oxfordien, which means that it is between 157 and 163 million years old. In this period after the second mass extinction there were many ammonite types. France is known for its rich variety of species. 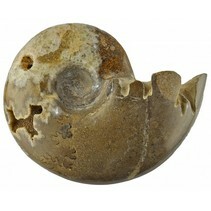 Unlike Moroccan ammonites and ammonites from Madagascar, there are few French specimens on offer. We are therefore very pleased that we have been able to purchase these ammonites from a French amateur geologist. Every year this man spends many hours looking for the finest French ammonites. The first Ammonites appeared about 410 million years ago and became very successful. They appeared in oceans worldwide in large numbers. Like the dinosaurs, ammonites got extinct about 65 million years ago. The Ammonites house consists of rooms. Whenever the hard case was too small for the animal it built a new room that was larger than the previous one. The animal always lived in the last build room. The empty rooms could be filled with water or gas. Like that the ammonite could travel between the surface and the bottem of the sea.